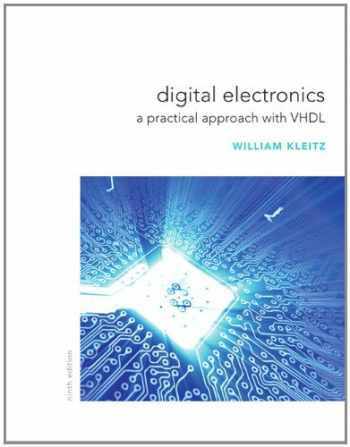 Acknowledged author William Kleitz wrote Digital Electronics: A Practical Approach with VHDL (9th Edition) comprising 976 pages back in 2011. Textbook and etextbook are published under ISBN 0132543036 and 9780132543033. Since then Digital Electronics: A Practical Approach with VHDL (9th Edition) textbook received total rating of 4 stars and was available to sell back to BooksRun online for the top buyback price of $54.80 or rent at the marketplace. Digital Electronics: A Practical Approach with VHDL, Ninth Edition, offers students an easy-to-learn-from resource that emphasizes practical application of circuit design, operation, and troubleshooting. Over 1,000 annotated color figures help explain circuit operation or emphasize critical components and input/output criteria. Throughout the text, the author employs a step-by-step approach that takes students from theory to example to application of the concepts. Over all nine editions, Kleitz has consistently sought out student feedback, along with his own experience of teaching the course in-class and on-line, to improve each new edition.